Each year, chefs from all over show off their finest creations at dinners given at the James Beard House. One notable local chef bestowed the honor to serve her food for guests at such a dinner was Helene An of Crustacean in Beverly Hills , one of the House of An’s many restaurant concepts. An’s James Beard Foundation meal showcased the chef’s greatest hits from some of her venues: the veggie Tiato roll from Tiato, a beef tartare from AnQi located in the South Coast Plaza, and, to be sure, the classic garlic noodles crowned with pan-roasted Maine lobster from Crustacean, to name a few. 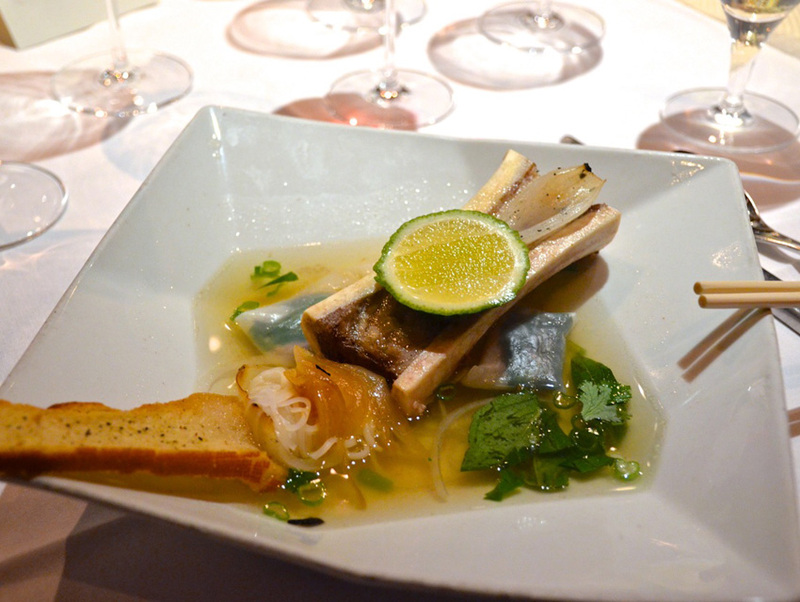 An has been invited twice to the James Beard House to share her French-Vietnamese genre of cooking. May 20, 2015 was the most recent James Beard Foundation dinner presented by An and her team. However, if you don’t live near or travel to the James Beard House—situated in Manhattan’s Greenwich Village—you’d never get a taste of these A-game gourmet experiences. Therefore, Helene An recreated the James Beard Foundation meal as the debut dinner for the exclusive dinner series called GourMonday. It was a good opportunity to get a taste of what was served at the revered brownstone. With contributions from chefs Tony Nguyen, Ron Lee, and grandson Derek, An put together the five-courser that was originally made for May’s Beard dinner for GourMonday’s kickoff as well. One of the stand-out courses was the French Onion Pho. This exquisitely refined yet rustic bowl cleverly blended the comforting elements of Vietnamese pho and French onion soup. It was less a mash-up than masterful application of mutual components, largely the onions. Jutting from the soup were a seasoned baguette and roasted bone marrow. Also, a small clump of rice noodles rested next to a braised brisket dumpling in rice flour wrap—simplicity and sophistication in steaming beef broth. Pho fever has taken us from no-nonsense home-style noodle soup lovingly simmered to Komodo’s astonishing Phorrito; Helene An’s French Onion Pho certainly rounds out the high-end of the pho spectrum. But considering An’s incredible journey from Vietnam to the U.S. after the fall of Saigon—a riches to rags to riches story—her French Onion Pho is more like personal history reflected in a bowl. A Viet-Korean fusion dinner is planned for the second GourMonday experience on July 27.